The day before yesterday, Anita was cleaning up our bedroom and decided to get rid of one of our more illustrious pieces of furniture - a stack of 4 yellow yaffa-blocks (I think that's what they are called). Anyway, they are those plastic crate looking things that snap together to make a cheap shelving unit that you always see college kids use in their rooms. Ours are leftover from that long ago. They were in Anita's room at college. These blocks were stacked in the living room until we could figure out what to do with them and Conner started playing with them yesterday. After he had been playing with them for a little while he asked for some more. There is a stack of 4 of them in his room as well that are holding some toys. Anita really didn't want to empty them off and bring them in for him to play with, but she didn't want to cut off the creative drive either so she went and got them and brought them out for him to play with. Anita and I were both totally blown away. Completely by himself he figured out how to lay these things out so that they would create a continuously flowing tunnel. He and Zach then played in them for the entire day. 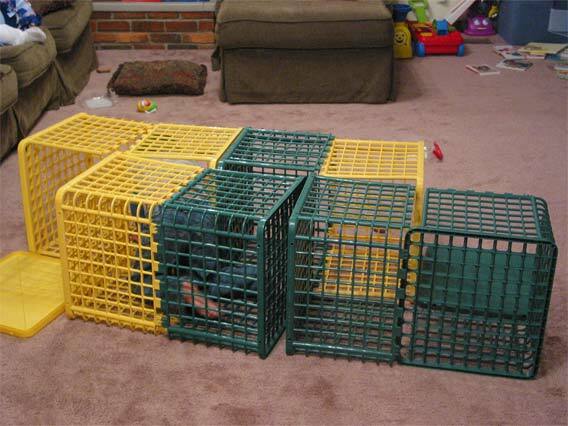 Later in the day, Conner covered the maze with pillows and blankets and started going searching for treasure. Under each of the lids at the end when you'd crawl through there was apparently buried treasure there. Under one there was an axe. Under the other there was a golden butterfly. When Zach, the destroyer, came through later and started dismantling the whole thing, Anita and I convinced Conner that Zach was trying to find out if there was treasure under the tunnel. Conner helped Zach toss the blocks around and then he exclaimed, "THERE IS MORE TREASURE! THERE ARE AXES FOR EVERYBODY!" We have NO idea where the axe thing came from. I asked him if there were any +2 battle axes. Anita just rolled her eyes. hehe. LOL :P Ask him if he could find a wand for aunt ashley...hers is kinda old.